The monument commemorates the European discovery of North West Bay by Bruni D`Entrecasteaux. 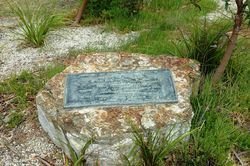 The French explorer, Bruni D`Entrecasteaux, was the first European to discover the channel separating Bruny Island from the mainland. In 1792 D`Entrecasteaux`s expedition sailed up the channel, now bearing his name, charting the coastline & naming features. He named the large bay at the top of the channel, North West Bay. The expedition anchored there to collect fresh water. Many aborigines were observed in the area. UNVEILED BY THE PRESIDENT OF THE TASMANIAN SOCIETY SIR ROBERT COSGROVE K.C.M.G.